ART AND SCIENCE united by ONE IMPULSE AND ONE LOGIC ! !…, We put to test and question the theory of creative dualism? An exclusive interview by Founder – SUNIL VILAS and an Indian Scientist/Artist’s Dr KRISHNA KUMARI CHALLA a member of GICAS on our topic of ART and SCIENCE, that would be helpful to introduce our current topic, and together follow our task and challenges that lay ahead for us. Art and science are directly related to each other.Both are created with the idea of creation.They differ in the method executed. My talent and knowledge of science and spiritualism combined with colors, accents of light and compositions helps me to fully express multi-dimensional balance and beauty of the everlasting interconnection between cosmos and earth. 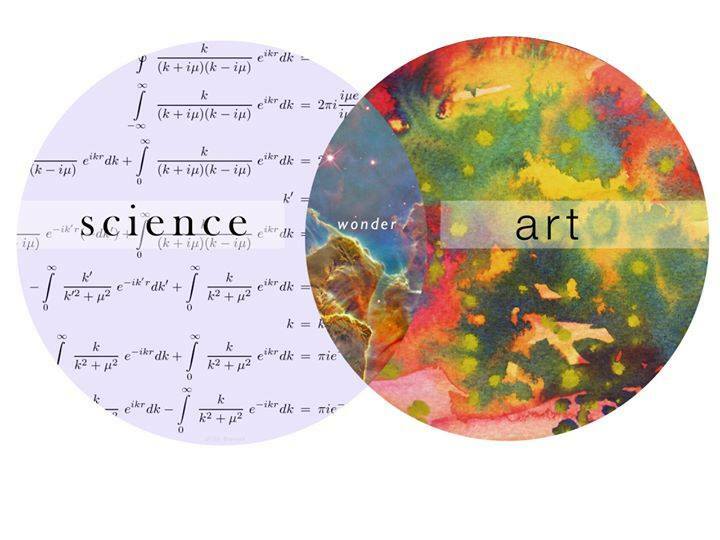 Art & Science: it is a wonderful topic that keeps intriguing me since my youth. It was the theme of my artist thesis as well. I’d like to add a few ideas to the subject, taking a psychological/spiritual point of view. What creates misunderstanding when people compare Science and Art is that these terms are not only seen as two different methods or approaches of man to his environment but that they also carry a deep symbolic meaning. It is therefore important not to mix up the “real” science, which relies on precisely determined rules and efficient toolset with “real” art which also has its inner logic and methodology. What do we really mean when talking about the synthesis of Art and Science? Art and Science in this context are the symbolic expressions of the basic opposites; similar to the opposites of conscious and unconscious; left brain and right brain; thinking and intuition, male and female principles; etc. The unification of the basic opposites is called Mysterium coniunctionis (term coined by C.G. Jung on the base of alchemist texts) or the process of individuation. People who completed this process are called ‘enlightened’ in the Eastern tradition. Visual Artist and Instructor at Studio One Cat SquaredArt and Science are the Yin and Yang of each other, for every Scientist must first think an abstract creative thought about the Universe and than set out to prove it methodically and every Artist must methodically approach a subject then creatively set out to produce the final results. G’Day Sandra, Not sure you have it right. I think art and craft are more like Yin and Yang. Good morning to all our GICAS members and guests who have been following our topic on ART and SCIENCES, and if we were to analyse our question further the IMPULSE and LOGIC; or if we were to consider the theory of the brain LEFT side being the Logical, analytical, and objective part while RIGHT side as our intuitive, thoughtful and objective side. Thank you to Charles, Isabelle, Graeme, Bob, Soudebeth, Fatemeh, Lane, Eva, and Sandra for your inputs and comments. .
As an organisation with global members we want to continue looking for answers and perhaps get more feedback to cover other aspects not cover yet. Through this process we are able to share the information and learn to develop our individual creative minds. G’Day Sunil, Maybe you need to update about the function of the brain hemispheres. Modern research in neuroscience has reveals the the left hemisphere processes data (input from the senses) according to time, whereas the right hemisphere processes the same data according to its spatial patterns. They operate together. No doubt scientific members will support this view. Good afternoon to all our GICAS members and guests hope you all enjoying a wonderful Thursday, here in the UK we having a lovely bright sunny day with clear skies and temp. reaching 26 degree quiet warm for this time of the year. We shouldn’t complain as it will soon be winter. Thank you Graeme for adding latest development from the field of modern science to add to our conversation..,. We want to continue our search for more interesting answers by adding yet another twist to the prospects. It is known research that we the human being as the most intelligent and highly evolved species on planet earth yet we go through our whole cycle of full life using only 10% – maximum 20% of our brain capacity. Question would be how to tap into extra 20% to 40% to double our capacity? and secondly how would that effect us as artists / creative minds?. And finally would that mean we would produce higher quality artworks or more recognised master pieces that would inspire our future generation?. Perhaps we could have further comments from Scientists / artists that are members amongst our organisation to add their valuable input. Please feel free to join us here in our creative lounge. .